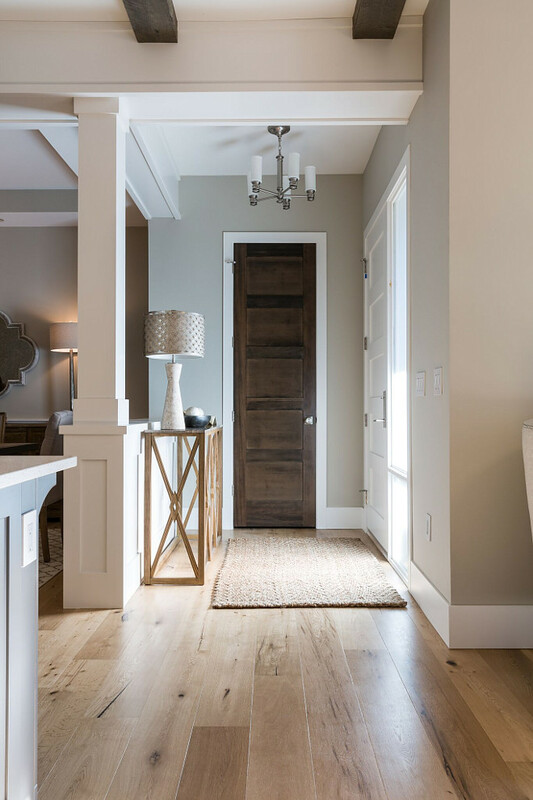 This modern farmhouse style townhouse is full of inspiring interior ideas and shows that you don’t need to comprise on style if you live in a townhouse. 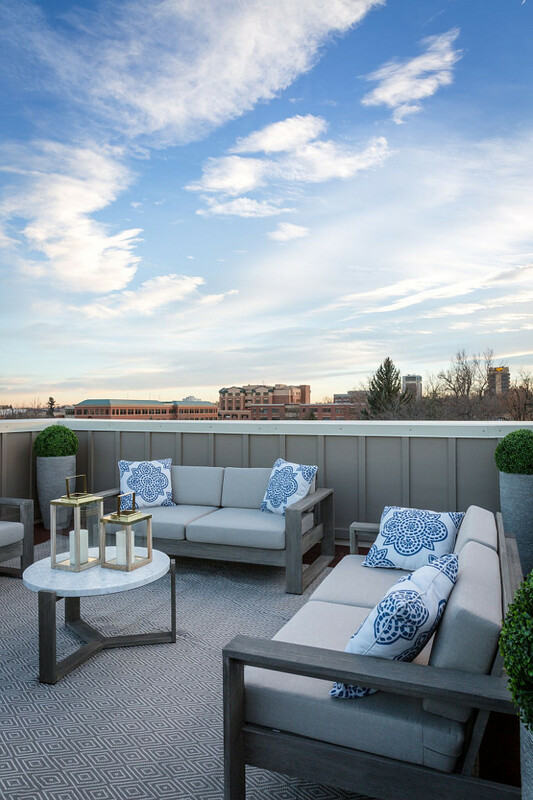 Restyle Design, LLC worked with the developer of these brownstones in Old Town Fort Collins to give them an upscale custom feel. 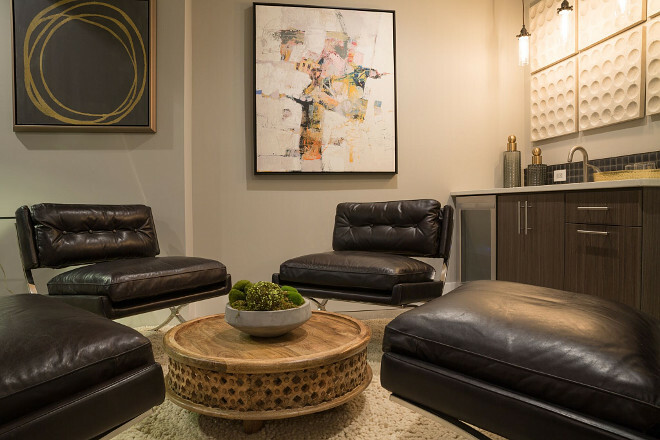 They went with classic finishes for a timeless look that would appeal to everyone. 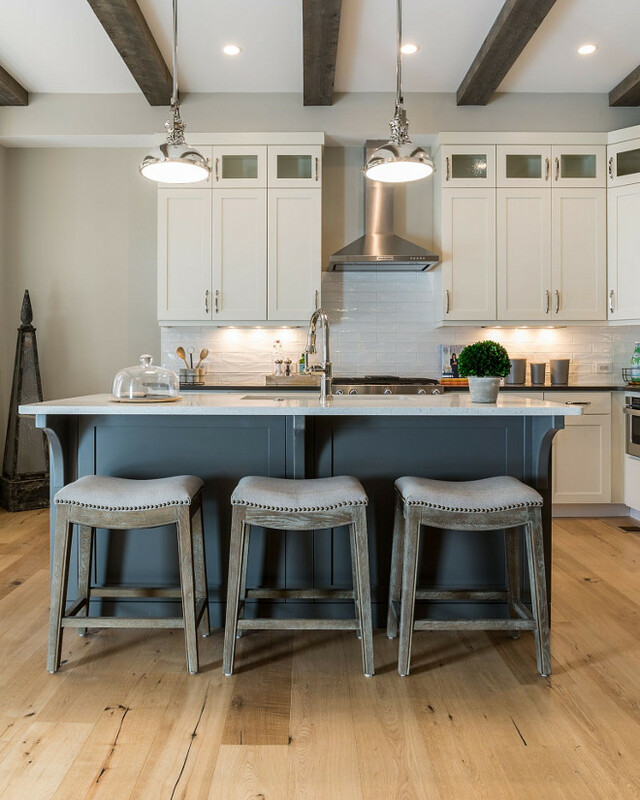 They started with wide plank European Oak flooring and added classic details like wood beams, white painted trim, and a neutral color palette of greys, blues and tans. 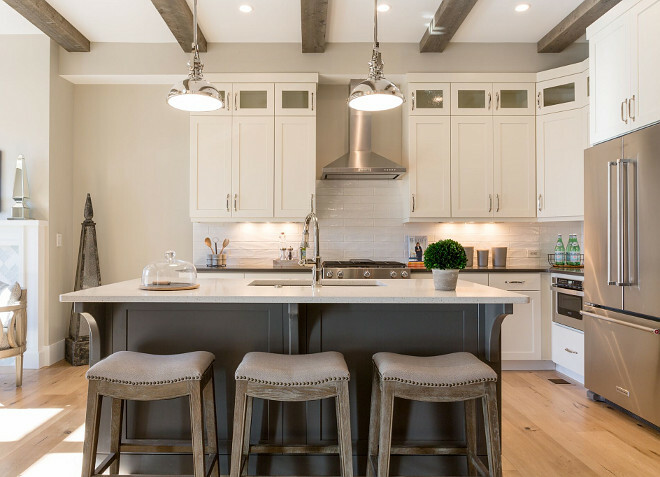 Lighting, decor and tile gives a unique personality and a custom feel to this modern farmhouse style townhouse. 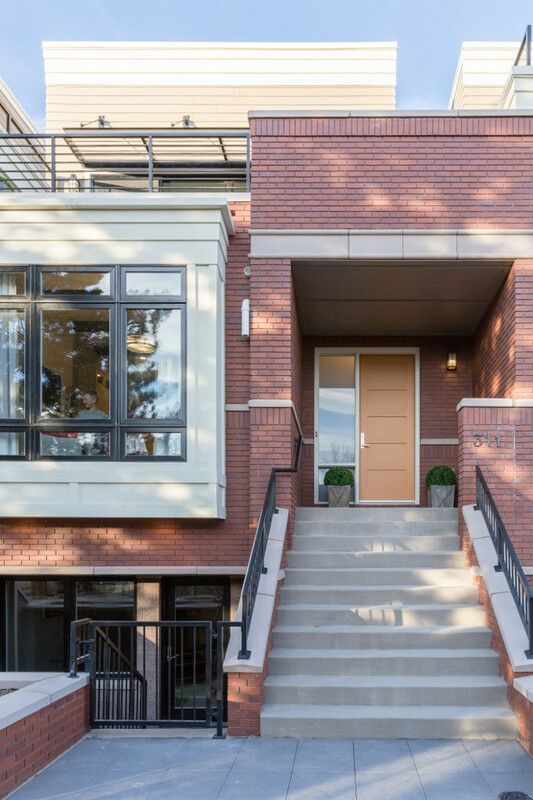 The foyer opens to a bright home with wide plank European Oak flooring. Paint color is Benjamin Moore HC 172 Revere Pewter. The kitchen opens to a bright living room. Kitchen wall paint color is “Benjamin Moore Revere Pewter”. The kitchen island paint color is SW Dependable Grey. Countertops: Arizona Tile Quartz Linen. Cabinets are wood with shaker style doors – perimeter cabinets are Sherwin Williams Dover White SW 6385. Countertops: Arizona Tile Quartz – Grey. 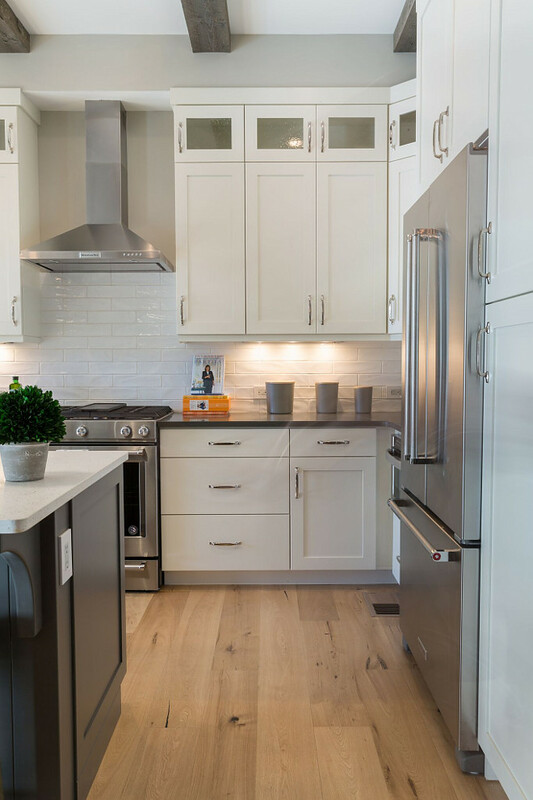 This white kitchen features stainless steel appliances, white backsplash tile and brushed nickel hardware. Backsplash: Capco New Yorker Bright White Gloss 3 x 12 Subway. What a soothing color scheme! 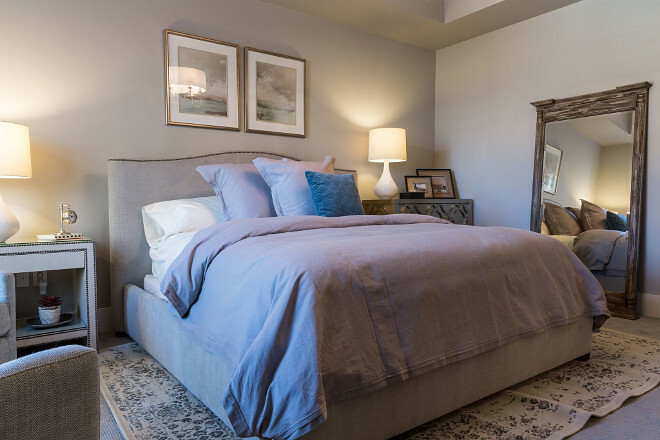 The paint color on walls is Benjamin Moore HC-172 Revere Pewter. Dining Table: Noir or here. 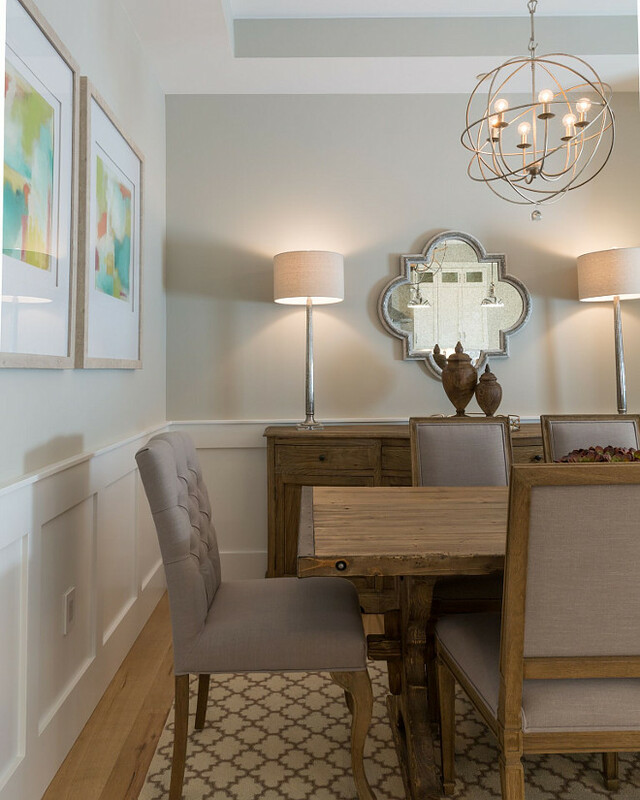 Host Dining Chairs: Gabby Home. 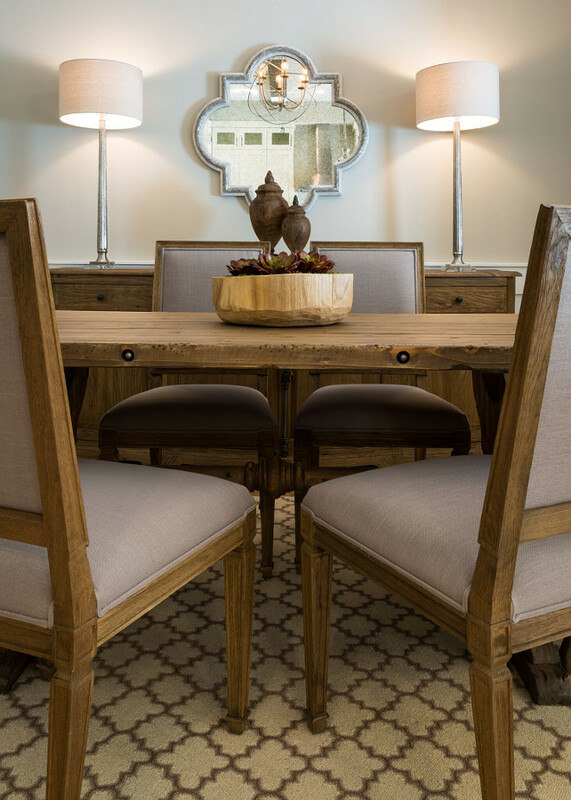 Square back dining chairs are Gabby Home. Rug is Dash & Albert. 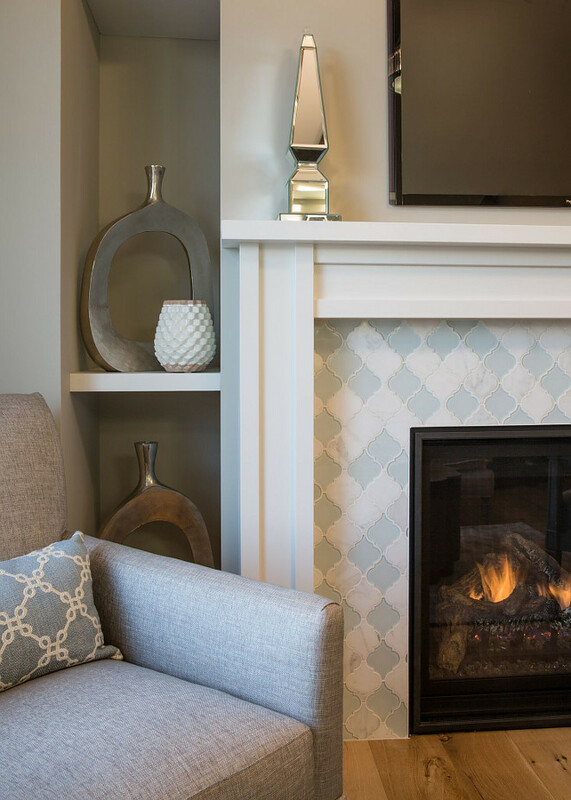 Fireplace: White woodwork surround with Moroccan Glass & marble inset by Soci Tremont – Tremont Pattern Wind Blend. 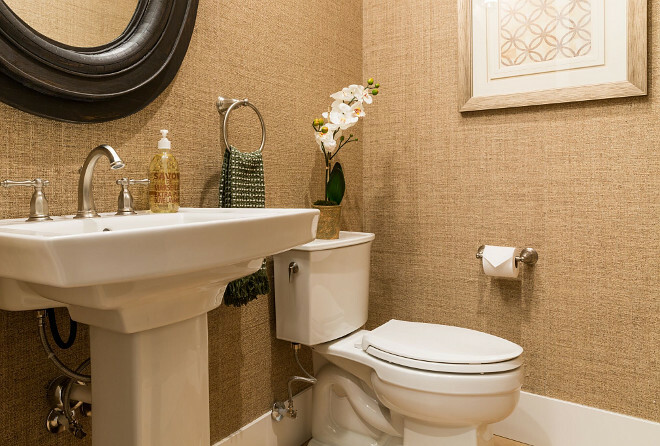 The powder room features Schumacher Weston Raffia Grasscloth Wallpaper. Art can be found here. 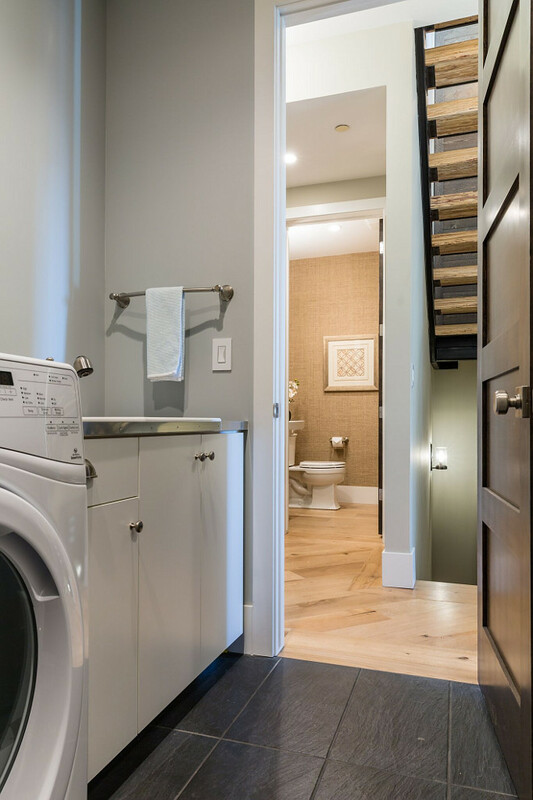 The laundry room features a durable floor tile. The laundry room flooring is a 12 x 24 ceramic tile from Florida Tile called Time 2.0 in charcoal. 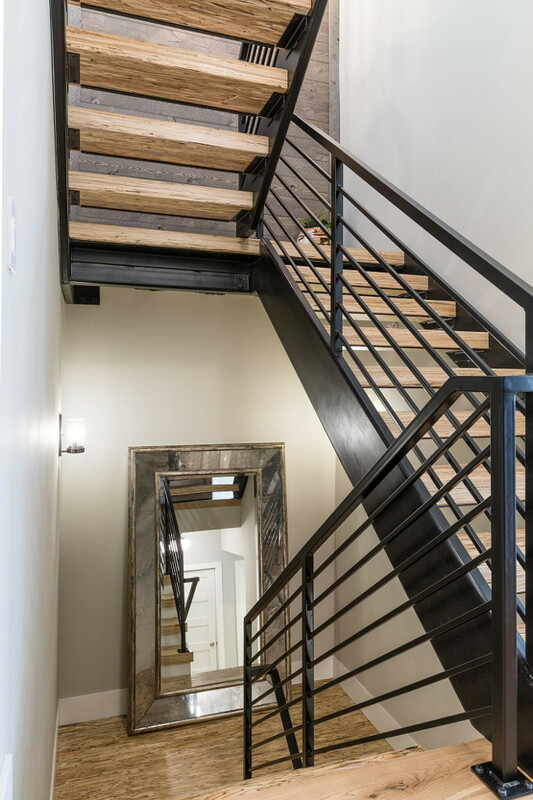 This staircase is all about the custom metal handrail. 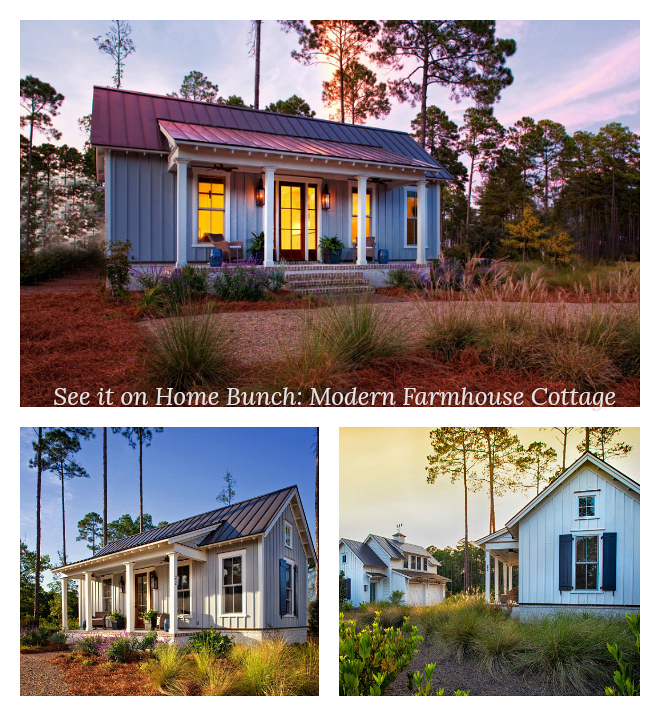 This is the new trend on modern farmhouses! 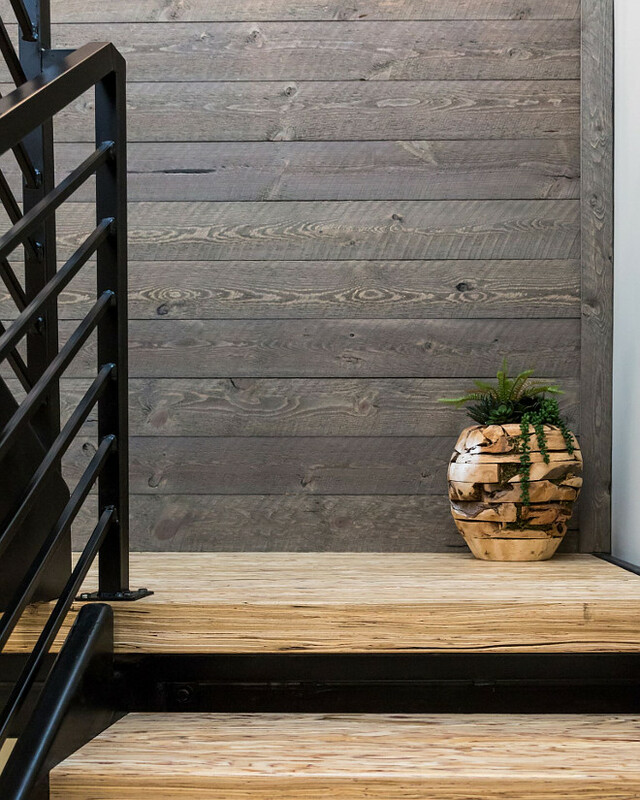 Barnwood shiplap creates a feature wall. The stair treads are Parallam. 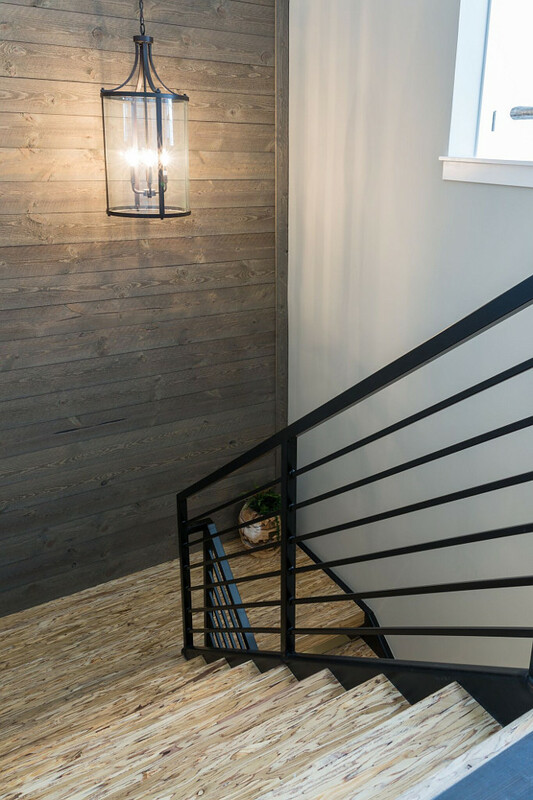 “Parallam” is n engineered laminate lumber, often used as structural beams and posts. It looks great here and it’s very durable. 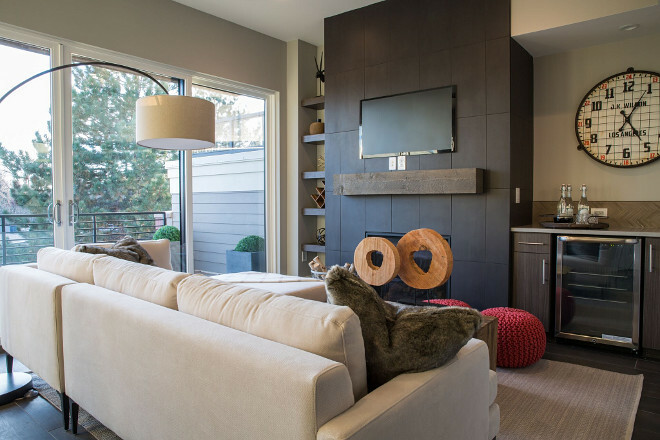 The upper family room is a great place to relax with friends or watch your favorite tv shows. Fireplace features 12 x 24 matte black tile – Florida Time 2.0 Black – and Barnwood wrapped beam for mantle. Cabinets are Takese Teak Laminate. Quartz: Arizona ACT Quartz Grey. Carved Wood Cocktail Table: West Elm. 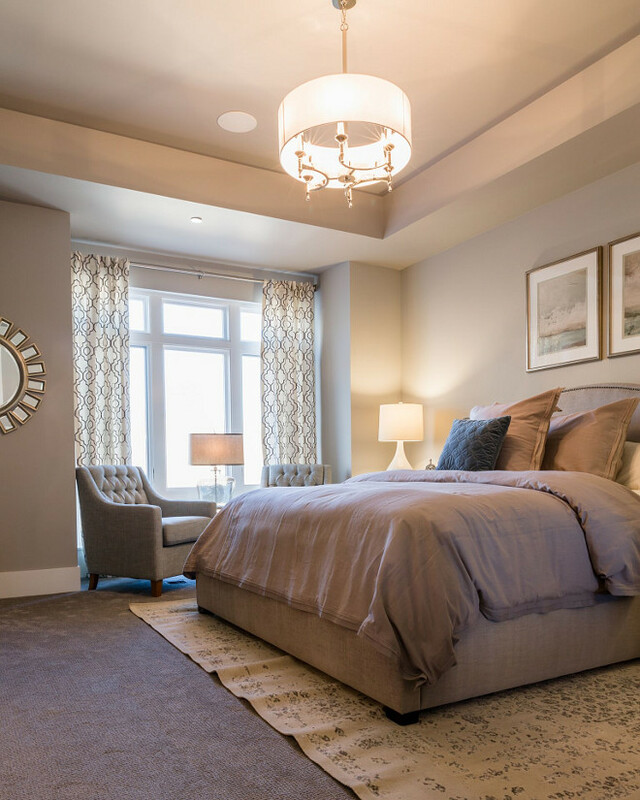 The master bedroom is serene and inviting. I especially love the neutral color palette. 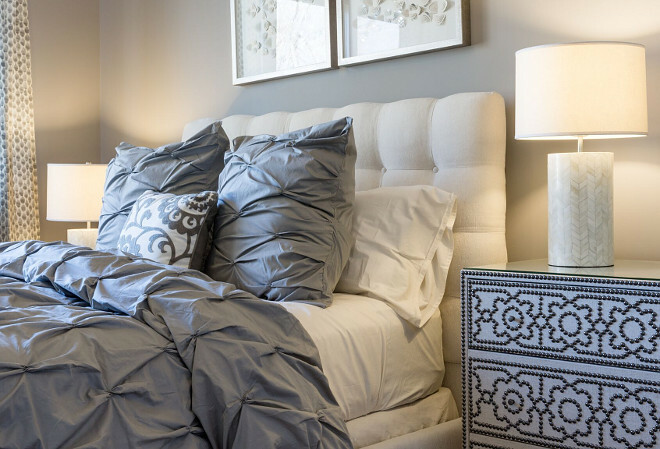 This soothing neutral paint color is Sherwin Williams Light French Grey SW0055. Window drapes are from Ballard Designs. 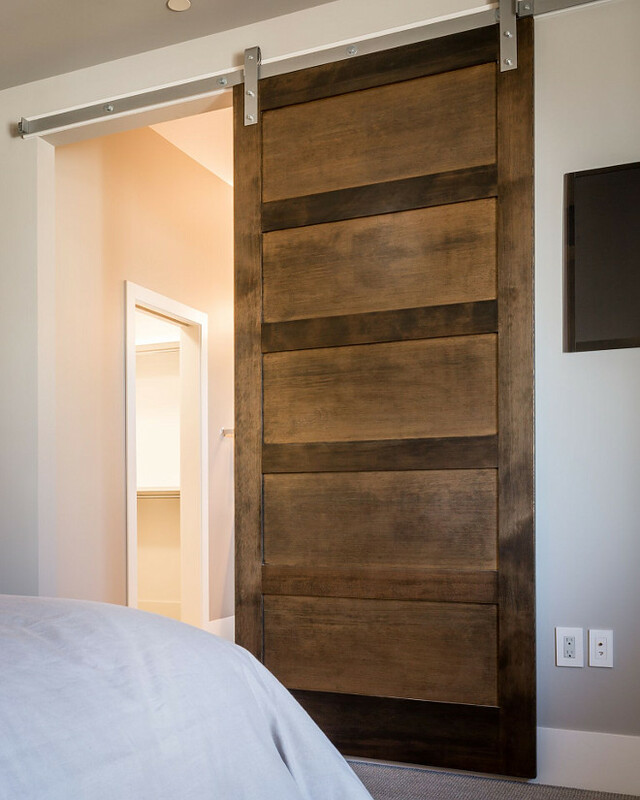 An Alder barn door conceals the master bathroom. 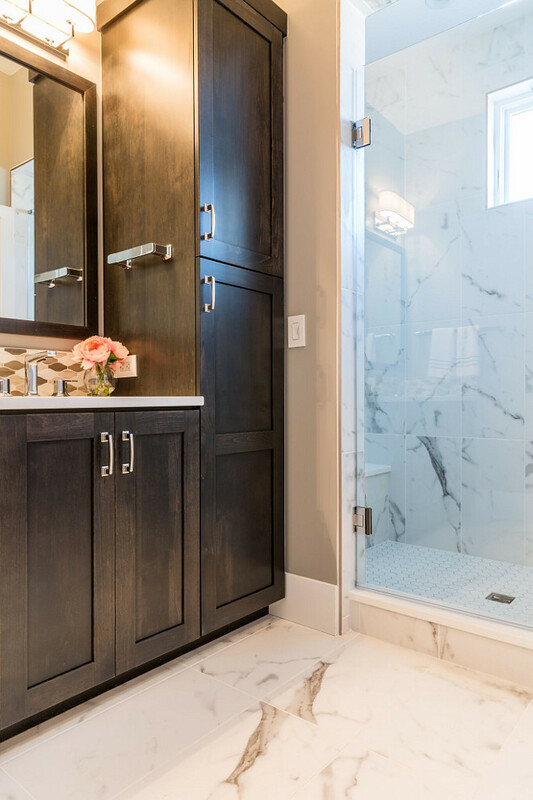 The master bathroom features Alder cabinets with black walnut stain. Countertop is Arizona ACT Quartz in Linen. Bedding is West Elm pintuck bedding. 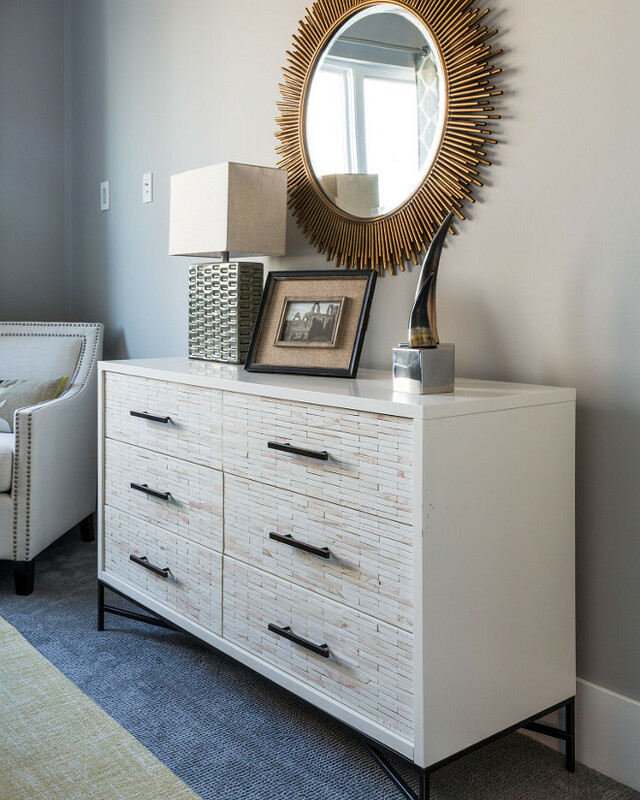 Dresser: Bernhardt Cabrillo Nailhead Dresser. Dresser is West Elm Wood Tiled Dresser. 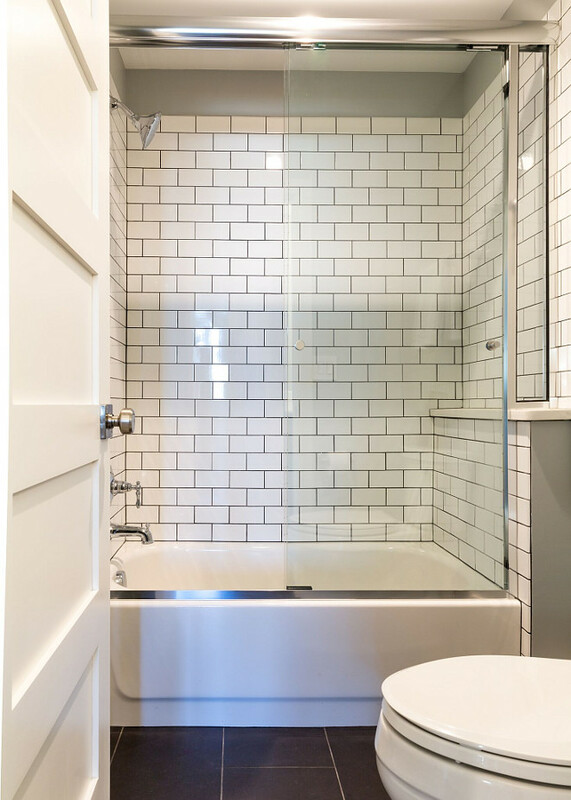 The guest bathroom features a shower/bath with subway tile. 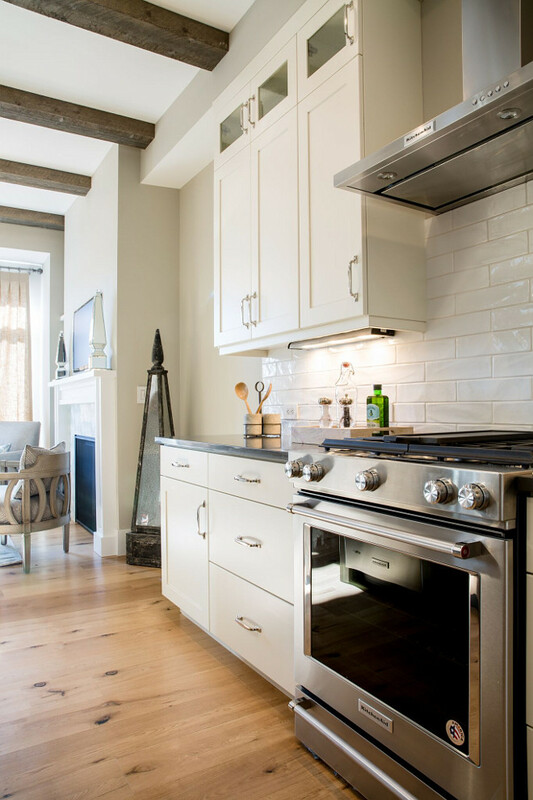 Similar white subway tile can be found here. 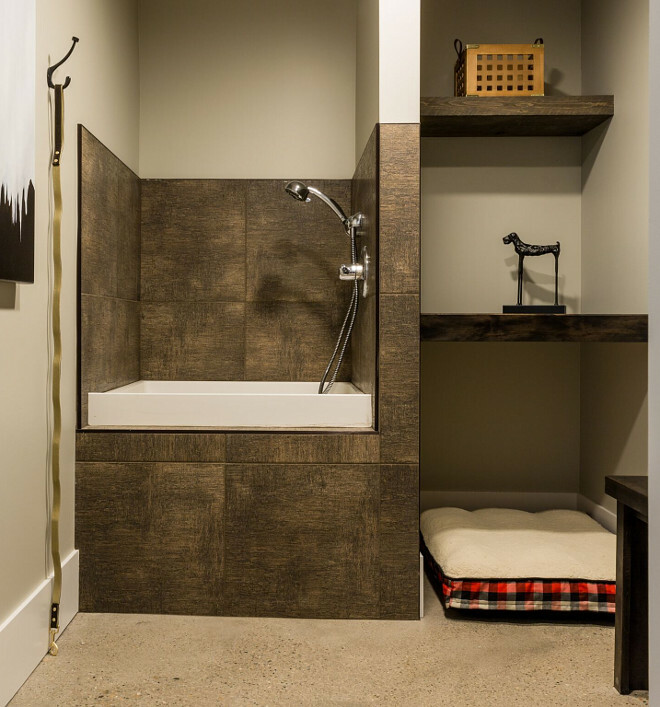 Mudroom/Dog Wash with custom cabinetry and dog shower. I love this idea! Very practical! Tile is 20 x 20 Capco Khadi. 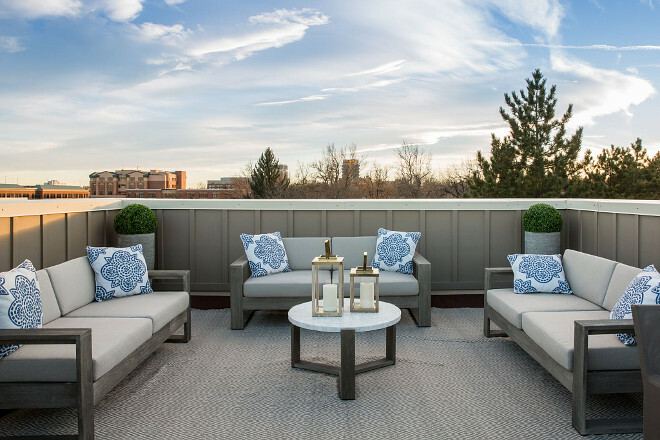 This roof deck maximize space and views. 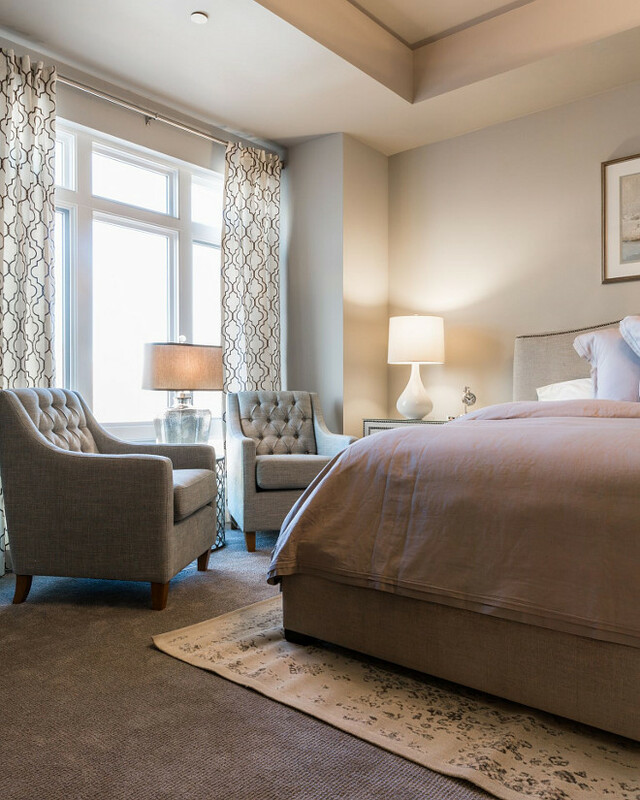 Interior Design: Restyle Design, LLC. 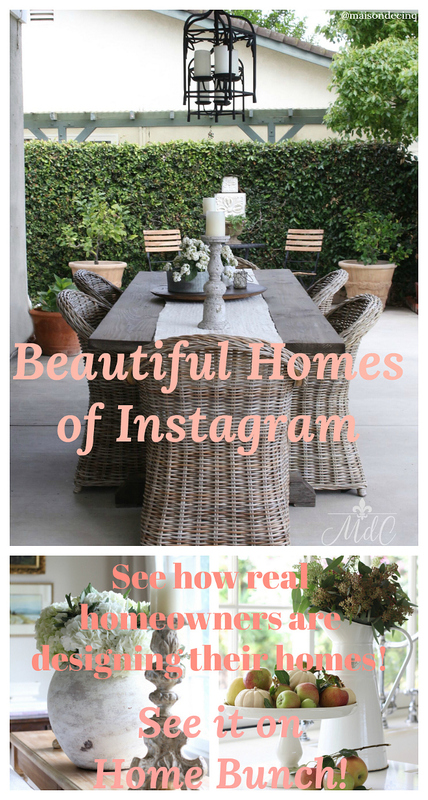 @maisondecinq: Beautiful Homes of Instagram. 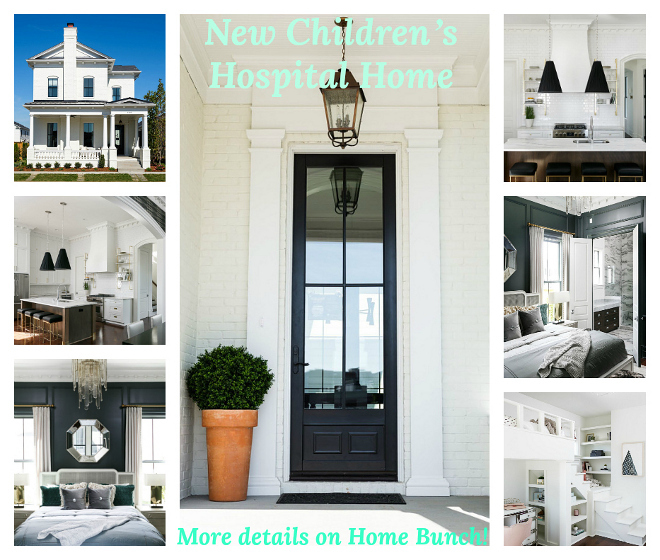 Tuesday: New Children’s Hospital Home. New & Improved Kitchen Design Ideas. New Southern Living Showcase Home. New Construction Modern Farmhouse Design Ideas. Pinterest: Many of you have written emails asking me why you aren’t being able to pin lately. Trust me, this is frustrating me more than you can imagine! I am trying to have this fixed and I am very sorry about this inconvenience. It’s truly not my fault but it seems to be an error from Pinterest. I will keep you posted if nothing changes. Meanwhile, feel free to pin from my Instagram. Thank you for your support, my friends. We’ll talk again tomorrow!